Parenting is by far one the most difficult jobs and thankless jobs and it does not come with instructions. Most parents want the best for their children by any means necessary and when it comes time to discipline them for unfavorable behavior, it’s usually tougher on the parent than it is on the child. One mother from Malaysia took her form of discipline beyond unbelievable and extreme. According to the Mirror, the mother chained and padlocked her daughter to a pole because she played hooky from school. The child was left for more than an hour with a bottle of water to drink and while passersby tried to get the 8-year-old girl removed from her makeshift prison, the authorities were called to assist. The child’s mother finally returned and removed the chains thus releasing the child from her form of punishment. According to reports it was the mother’s first time disciplining the child in this manner however the authorities are still investigating the situation. First time or not people are calling for the mother’s head for what she did to the little girl. Nothing is ever that bad to be chained like an animal. A cruel mum chained her young daughter to a lamp-post as a punishment for her playing truant from school. This shocking photo shows the tearful eight-year-old child with a metal chain hooked around her ankle and tied to a large metal post. 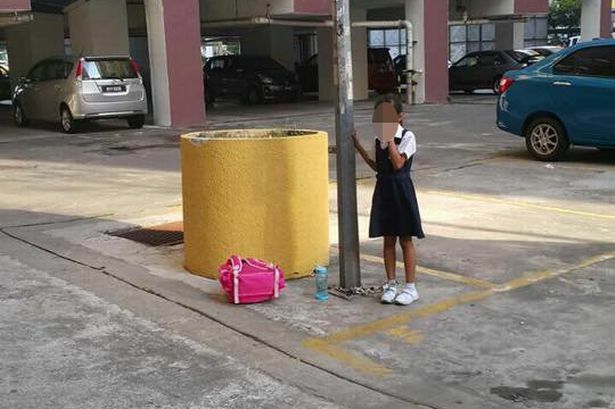 The youngster, who has not been named, covers her mouth and looks on with a sad expression after being left in a car park in Kuala Lumpur by her raging mother. Horrified onlookers heard the girl crying while sucking her thumb in the car park outside the family’s apartment on Wednesday afternoon. They tried to free her but the thick chain had been secured with two padlocks – leaving the youngster stuck for over an hour before police arrived. She told cops that her 30-year-old mum had punished her because she failed to attend mandarin classes at school in Kuala Lumpur, Malaysia. An onlooker who pictured the scene but asked not to be identified said: ”There is such a thing as tough love but this is taking it too far. ”The girl was quite clearly upset and didn’t know what to do. She was sucking her thumb and had tears in her eyes. 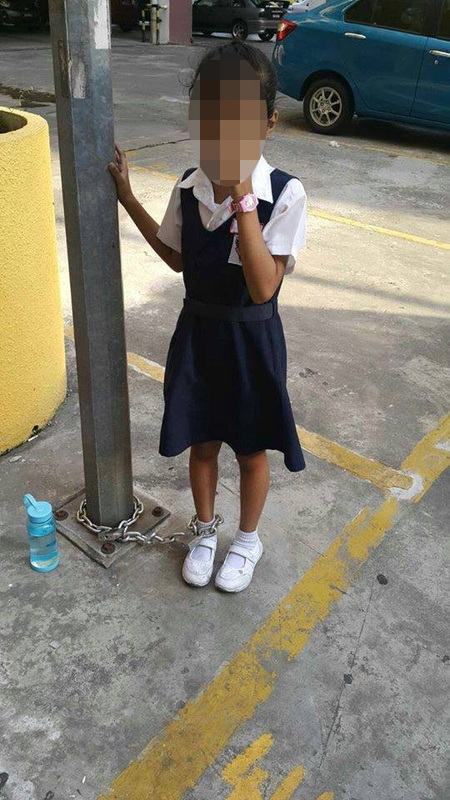 The pictures show the girl in school uniform with her right ankle locked to a metal lamppost. The girl had been locked up for around an hour before neighbours called police, who arrived around ten minutes later and tracked down the mum to a nearby flat. The unemployed woman was taken in for questioning and later released. Mohammad Azlin Sadari from Subang Jaya district police said: ”We received a call from a man informing us of an eight-year-old Indian girl with her leg chained. “The DCC then instructed the motorcycle patrolling unit to go to Lagoon Perdana Apartment in Bandar Sunway. ”We have been asked to investigate further to make sure that the root cause of the action is looked into.